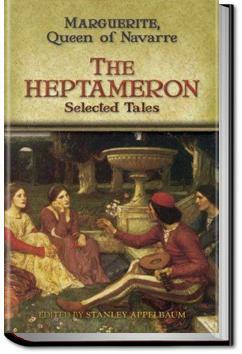 THE HEPTAMERON, is divided into seven complete days containing 10 stories each, and an eighth day containing only 2 stories. The stories, many of which deal with love and infidelity, resulted in "accusations of looseness" by critics of the day. The author, Margaret of Navarre (also known as Margaret of Angoulême) became an influential woman in the intellectual and cultural circles of the French Renaissance. . . .observation of those who knew by experience how to distinguish a lover's looks from another man's; for when Florida, thinking no evil, came and spoke familiarly to him, the fire that was hidden in his heart so consumed him that he could not keep the colour from rising to his face or sparks of flame from darting from his eyes. Thus, in order that none might be any the wiser, he began to pay court to a very beautiful lady named Paulina, a woman so famed for beauty in her day that few men who saw her escaped from her toils. I hope de Navarre is suing the makers of the Tudors. I really do. Talk about your love triangles. Marguerite de Navarre was the sister of Francis I of France and so was the grandmother of Henri de Navarre, and the great-aunt of Marguerite, better known as 'la reine Margot' from the Dumas novel and far more fabulous film. Marguerite de Navarre was the sister of Francis I of France and so was the grandmother of Henri de Navarre, and the great-aunt of Marguerite, better known as 'la reine Margot' from the Dumas novel.